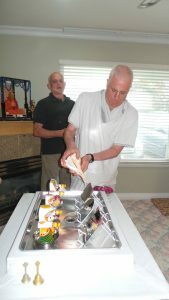 Original, unrevised books of Srila Prabhupada were given to the new guest. 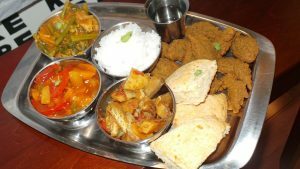 Devotees enjoyed the delicious prasadam offered to Krishna Balaram through Srila Prabhupada. Kirtan as usual was very ecstatic. 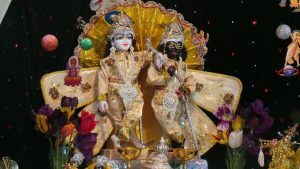 The topic in the class was about the impersonal feature of the Supreme Lord Krishna. 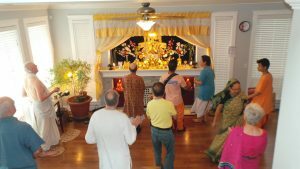 Our simple Janmastami celebration at Vancouver Krishna Balaram Temple. This is a small group of Prabhupada’s followers. Our preaching method is in accordance with the original instructions of Srila Prabhupada. The philosophy discussions are based on his original books. The sweet & sour subji prasad was the favourite of the day. Devotees asked for more sweet & sour subji to take home. Our first program at the new location. We have more space for the devotees to sing and dance for the glorification of Krishna Balaram and Srila Prabhupada, our dear most Spiritual Master. 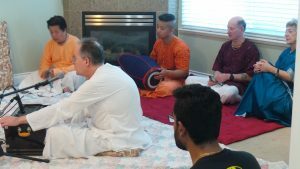 Vancouver Krishna Balaram Temple welcomes a senior sincere Prabhupada follower from Montreal, as well as two young guests. 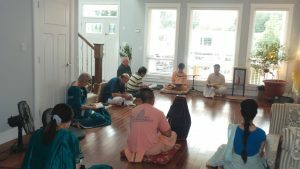 The devotees were blissful while participating in the Kirtan, Prasadam and Bhagavad-gita discussion under the guidance of Srila Prabhupada. 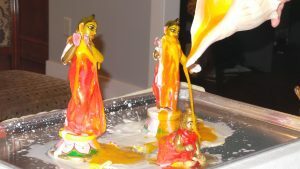 Outreach Program by the Vancouver Krishna Balaram Temple. Books of Srila Prabhupada were handed out to the new guests. Jai Srila Prabhupada! You can also experience the transcendental happiness felt by these devotees by taking shelter under Srila Prabhupada in glorifying Lord Krishna. The only way to Lord Krishna is through the bonafide spiritual master, and that is none other than Srila Prabhupada.